MTHFR - Information, Videos, Homeopathy, Lab Testing and More! Homeopathic remedies can support healing and detoxification for those with MTHFR genetic mutations of both A1298C and C677T plus other SNP's and mutations. Homeopathy supports the detoxification pathways, help reduce yeast, reduces dysbiotic gut bacteria, reduces the heavy metal burden in the body for gut health and recovery! Contact us to learn more about how homeopathy will support optimal detoxification and holistic health! What Conditions Are Related to MTHFR? Where Do the Genes Come From? Which Mutations Matter Most For Gut Disruption from Stress? The Human Genome Project was finished in 2003 and it was discovered that an important gene called methylenetetrahydrofolate reductase (MTHFR) which supports one's health, well-being and detoxification was defective in a fairly large percentage of the population. About 45% of Caucasians, 70% of Hispanics and about 30% of southern Italians have a genetic defect. The MTHFR gene produces the MTHFR enzyme. This enzyme is responsible for the circulating form of folate. Folate is very important in homocysteine regulation. 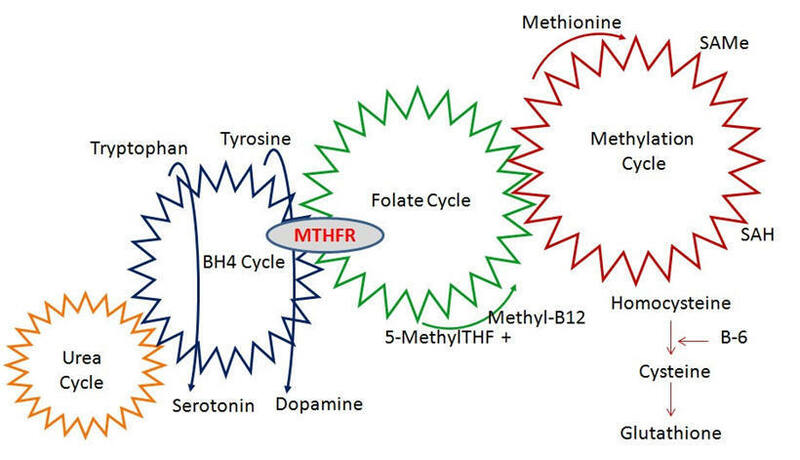 The MTHFR enzyme metabolizes folic acid into 5-MTHF, which is needed to combine with homocysteine to break it down and to facilitate methylation (detoxification) processes in the body. The MTHFR enzyme is essential for the body to function properly and affects more than 20 different processes. Having a MTHFR mutation means that the enzyme that converts folic acid into it’s activated form (5-MTHF) acts in a less than normal capacity. The more genetic mutations one has, the less the MTHFR enzyme acts in a complex process that produces glutathione at the end of the cycle. Glutathione is the body's number one antioxidant. A defective MTHFR enzyme in the different varieties means that detoxification function is less than optimal. It can be performing 20% reduced capacity, or loose as much 80% of its capacity in some cases. It can mean that you just don’t break down toxins well. Remember that MTHFR gene mutations can cause absolutely no symptoms at all. It is the environment determines whether or not genes turn "on" or "off". Everyone is unique and different. Many other genetic and especially environmental factors well as lifestyle, stress and a person's mental/emotional landscape will powerfully influence health and gene expression. Autism 98% of children with autism will have one or more of these genetic mutations. We get two copies of most of the genes that we are born with - one from our mother and one from our father. The MTHFR gene mutation involves two of these MTHFR genes the A1298C and C677T. Their numbers refer to their location on the MTHFR gene. These are also written as just 677 and 1298. There are over 50 known MTHFR variants of this important gene which can be passed down by one, or both or your parents. The most common ones that doctors will look for is C677T, A1298C, P39P and R594Q. Some mutations are more serious than others and warrant nutritional and homeopathic interventions. If you are heterozygous that means you have one affected gene and one normal gene. The MTHFR enzyme will run at about 30% to 70% efficiency compared to a normal MTHFR enzyme. If you are homozygous, then the enzyme efficiency drops down to 7% to 10% of normal efficiency, which of makes a huge difference. Homozygous C677T / Homozygous A1298C: this is called Compound Homozygous - this means you have two C677T, two A1298C. Triple heterozygous mutations (most rare): would be some other combination, like one C677T, one A1298C, and a P39P or R594Q, for example. If you plan to become pregnant, we strongly recommend genetic testing for both parents. Women with a history of infertility, miscarriage(s) or still birth or Down's syndrome should always be tested for the MTHFR by their medical doctor. This is simple blood test that is normally covered by insurance. A blood sample can be taken at the same time as other blood draw. Also, if you plan to become pregnant, we also strongly recommend that you do a Vitamin D 25 hydroxy blood test for both parents. It is the current recommendation of the researchers at the Vitamin D council that both parents each supplement Vitamin D at 5,000 IU's per day, for a full year before becoming pregnant. Read more about Vitamin D.
A pregnant woman not already tested for MTHFR should also test. Ask for this blood test from your doctor. Some doctors are not yet trained or familiar with the MTHFR testing and may not advise you to get it, but insist. You want to know this information so that you can correctly supplement during your pregnancy! If you are pregnant, you need to be supplementing folic acid. Most doctors will recommend about 800 mcg of folic acid per day. However, you must be supplementing the CORRECT FORM of methylfolate, not "folic acid" which is a synthetic version if you have an MTHFR gene mutation. Specifically, you need L-methylfolate, which is a form your body can use because with MTHFR, you have problems converting folic acid to a usable form for fetal development. Folate is essential to healthy DNA replication, which is required in healthy baby making. L-methylfolate supplements are affordable and easy to get online supplements without a prescription. Depending on which genetic mutations are shown in your MTHFR testing, especially for the mother, supplementing the correct forms are essential for a healthy pregnancy and baby! In women, pregnancy complications and an increase risk of fetal open neuro tube defects have been reported for those with C677T mutations. You will need to take a prenatal supplement that contains L-methylfolate - NOT folic acid. L-methylfolate is a food based vitamin and thus not patentable. There are variations in the type of methylfolate used in various supplements and prescriptions. You want to be sure you are getting the correct, most absorbable form! Contact us for more information about supplementation and homeopathy for MTHFR mutations. Cholestyramine (depletes cobalamin and folate absorption) – common in gallbladder issues during pregnancy! You can only know for certain if you have this MTHFR mutation with blood or saliva testing, which is done only once in a lifetime. Labs that test for MTHFR with blood or saliva look at your unique DNA sequence to determine if one or both copies of your genes have a mutation at a specific location in a specific gene. Note: 23andMe.com saves close to a million pieces of genetic data from your DNA. The test is easy, and there is no doctor needed. Go to 23andMe.com, order a kit, spit in a tube, and they run your DNA through their lab. This company has a database of over 400,000 people and provides comprehensives ancestry reports. FDA Current Ruling: Unfortunately, because of recent concerns from the FDA, 23andMe.com is not currently able to provide health-related related data. However, they still provides you full access to your raw data. This means that when you order your kit, you will be able to use Genetic Genie or other for methylation and detox profiles. Note: They store your DNA test results and DNA sample without your name or other common identifying information. You own your DNA data. At any time, you can choose to download raw DNA data, have us delete your DNA test results as described in the AncestryDNA Privacy Statement, or have them destroy it. Note: Data is not sold or shared with any third parties. Once you get the analysis from 23andMe, you can UPLOAD it to https://geneticgenie.org/ for a free (donations are accepted). This website automates a methylation gene analysis just by reading your 23andMe raw data. Simply click on the Methylation Analysis tab, upload your www.23andMe.com data, and you’ll receive your results. Once you get the analysis from 23andMe, you can UPLOAD it to www.livewello.com to free for a detailed report. The Livewello Gene App is a Variance Report Software that will run your 23andMe Genome, and generates your Phenotype for an unlimited number of Single Nucleotide Polymorphisms (SNPs). This helps you better understand your 23andMe results. They offer an extensive chart for your SNPs (Single-nucleotide polymorphism) that you and your health practitioner can further investigate to setup an individual-based treatment plan. These reports are "the most comprehensive and accurate available", containing sections on eye health, detox, tongue tie/cleft palate, methylation, allergy/mold, IgE, IgA, IgG, clotting disorders, thyroid, celiacs/gluten intolerance, mitochondrial function and sulfonotransferase genes. Homeopathy is a 200 year old, scientifically proven medical system that provides a comprehensive method of detoxifying the body, including heavy metals, strengthen organ functions both gently and safely! Homeopathy will improve the global detoxification process and support this process in the body. Stress and Lifestyle: Chronic emotional stressors and a high stress lifestyle are a chronic, damaging energetic influence to those with MTHFR mutations in particular. Classical homeopathy is one of the most important modalities (if not the most important!) in treating MTHFR and reducing toxin load. Aluminum Toxicity: Metal detoxification, especially of aluminum, can help address dysfunctions associated with MTHFR A1298C and can help many other biochemical abnormalities as well. Aluminum toxicity can slow your ability to fight infection. Many autoimmune diseases have connections to aluminum, including Alzheimer's. Bacterial Infections: Addressing the gut and treating chronic bacterial infections including strep or staph infections is also critically important. The PANDAS diagnosis which correlates to chronic strep infections is strongly correlated to the MTHFR gene mutations, as are hyperthyroid and hypothyroid disorders. Dental Fillings with Mercury: Avoiding getting any mercury fillings! Remove any mercury fillings you currently have safely, using the safe "Huggins Protocol" or a mercury free, holistic dentist. Diet: Diet is very important! Eat organic, whole foods whenever possible. A healthy, organic diet included foods that contain the active and natural form of folate (Vitamin B9). Dried herbs like spearmint, rosemary, basil, chervil, coriander, marjoram, thyme, bay leaf and dried parsley. Some people do well on a diet such as Paleo or the GAPS diet. Environmental Toxins: Limit your exposure to environmental toxins, chemicals and pesticides. Remove your shoes in your home to keep your home more protected. Filtered Water: always drink filtered water to remove as many toxins as possible. Gut Health: Repairing the digestive system and optimizing the flora with homeopathic care as well as probiotics should be the first step in correcting methylation deficiency, reducing gut inflammation, dysbiotic bacteria, and yeast (candida). This is because of the toxins it releases that inhibiting proper methylation. Someone who is chronically constipated will have reduced detoxification pathway until this issue is corrected. Certain supplements can be helpful, but can be a bit complicated and may require the support of a skilled homeopath or health care professional with experience in this area. You should have the MTHFR genetic testing done in order to know what to supplement properly. L-methylfolate supplements are helpful. This also called 5-MTHF or 5-methyltetrahydrofolate. B12, Folate, SAMe, and B6: Methylation can be better supported with these supplements. P-5-P: This is another good B-vitamin is the methyl version of B6. Synthetic Folic Acid Dangers: Some people with MTHFR will have high folic acid when lab tested. Folic acid is a synthetic form of folate, Vitamin B9. To learn more, Watch the 2 videos below about folic acid. Folic acid accumulates in the body when there is a defect in the MTHFR gene that prevents the body from using it. It goes high and is unused. One solution to reducing folic acid levels is to avoid all supplements with folic acid in them. Also avoid processed and white flour based foods with folic acid. This is especially important if you are homozygous - having one copy of the same defective gene from both parents. Methylcobalamin (methyl B12): With the MTHFR mutations, B12 might also be high, so those people with this mutation need to avoid the synthetic supplemental version of B12 called cyanocobalamin. Instead, they need take a more useable form called methylcobalamin (methyl B12). However, because the methyl B12 will be used by your body in the detoxification process, you will need to start low and go slowly - to avoid any strong detox side effects like fatigue or achiness such as in a Herxheimer's reaction. This often requires the support of a skilled homeopath or health care professional with experience in this area. Order US lab, quality supplements for methlyfolate, Vitamin B complex and other important supplements here. Homeopathic remedies offer a safe and natural alternative to dramatically improve your detoxification pathways. Homeopathy is a holistic approach that allows body to heal, mind and body to various stress whether emotional, spiritual, physical or environmental. Although mutations can occur at any time during our lifetime, it is more likely that we are born with these mutations and will have them throughout our life. These mutations are inherited and passed down to us from previous generations, from our parents and grandparents and may be passed to future generations - our children. This may provide an explanation as to why certain traits or diseases "run in the family". It is important to understand that having a gene with a mutation does not mean that the gene is nonfunctioning. It means that it is working with an altered state of efficiency. Sometimes this means that it is working at a decreased level, but it could also mean that it is working at a higher than normal efficiency OR that the gene is lacking regulatory mechanisms normally involved in its expression. People with MTHFR also have a reduced ability to eliminate toxins and heavy metals. High levels levels mercury, copper, aluminum or high other heavy metals in the body can result from poor methylation from the MTHFR mutations. This is the phenomenon of shifting gene expressions. Human genes are capable of shifting expression in as little as 24 hours. You are not simply the result of your genes....there is no genetic determinism. Your environment, which includes the thoughts you think, determines what genes you will express. The genes we receive are only a "blueprint "- not the final outcome. Homeopathy is an energy medicine that influences genetic expression by influencing the mental, physical and emotional environment of a person. The word epigenetic literally means “in addition to changes in genetic sequence.” The term has evolved to include any process that alters gene activity without changing the DNA sequence, and leads to modifications that can be transmitted to daughter cells (although experiments show that some epigenetic changes can be reversed). Researchers have demonstrated that certain genes can be over OR under expressed with certain disease processes. Studies have found that epigenetic effects occur not just in the womb, but over the full course of a human life span. By understanding of how these genes are regulated and what is influencing them, including mental and emotions stresses, we are able to influence their expression with homeopathic care. A1298C mutations - generally to neurological and immune system disorders. C677T mutations - generally associated with cardiovascular disorders. Which Mutations Matter the Most For Gut Disruption from Stress? Stress hormones cause rapid growth of gram negative bacteria that is very sensitive to what we are experiencing. In stress, these multiply very rapidly. ACE - causes higher levels of Angiogenesis Converting Enzyme - this released in response to adrenals to stress andn causes constriction to blood flow in the gut. COMT - Catechol-O-Methly-Transferase - keep gene in breaking down hormones, adrenaline, epinephrine and norepinephrine that cause bacteria in the gut to grow. GAD - Glutamic Acid Decarboxylase - does not allow you to break down glutamate easily and causes inflammation in the nervous system and causes a stress response. MTHFR - MTHFR A1298, C677, MTR, MTRR, MTHFS, etc. effects how we process folate for energy and the methylation cycle. Homocysteine is an inflammatory marker in blood tests often elevated with C677T mutation. In women, pregnancy complications and an increase risk of fetal open neuro tube defects have been reported. The A1298C mutation is relatively common but it is NOT associated with elevated homocysteine levels like the C677T mutation. A homozygous gene for A1298C (2 copies, one from each parent) results in about a 40% reduction in methylation from normal activity. A heterozygous gene for A1298C (1 copies, from one parent) results in about a 20% reduction in methylation from normal activity. The A1298C mutation may cause a decrease in neurotransmitters or catecholamines including serotonin, melatonin, dopamine, norepinephrine, and epinephrine. The A1298C mutation is also a cofactor in the production of nitric oxide. Supplementing with L-Methylfolate can help alleviate the effects of MTHFR A1298C as well as lower the homocysteine levels. Avoiding all synthetic folic acid and folic acid fortified foods such as cereals and all white flour enriched products is also strongly recommended. Removing other types of synthetic folic acid from any supplements is strongly recommended, as they can compete with L-methylfolate. The ethnic groups with the highest populations of C677T gene variants are Italian, Mexican and Chinese populations. About 5% of Caucasians and 1.4% of African-Americans are C677T homozygous (2 copies of this gene) and are likely to have elevated serum homocysteine levels. A homozygous gene for C677T (2 copies, one from each parent) results in about a 40% reduction in methylation from normal activity. A heterozygous gene for C677T (1 copies, from one parent) results in about a 20% reduction in methylation from normal activity. The C677T mutation can cause elevated homocysteine levels in individuals with insufficient folate, particularly when there are two gene mutations (one from each parent) present. One function of the MTHFR enzyme is to help convert homocysteine to methionine. A MTHFR C677T mutation means that the MTHFR enzyme may have trouble performing its task leading to high levels of homocysteine. According to Dr. Ben Lynch, impaired function of the enzyme can cause or contribute to conditions such as Autism, Chronic Fatigue Syndrome, Fibromyalgia, Miscarriages, IBS, many birth defects, Multiple Sclerosis, Alzheimer's, Bipolar Disorder, blood clots, Stroke, Chemical Sensitivity, and many other conditions. |High blood levels of homocysteine are also a risk factor for cerebrovascular disease, cerebral vein thrombosis, coronary artery disease, myocardial infarction and venous thrombosis. MTHFR C677T can also lead to high homocysteine. You can ask your doctor to test for blood homocysteine levels. If you have high levels of homocysteine, it may be related to your MTHFR C677T mutation, although it does not necessarily mean that they will have high homocysteine levels. High homocysteine levels cannot rely only on genetic testing but also need to take into consideration clinical findings such as serum homocysteine levels. The levels of homocysteine in the serum are influenced by both genetic and environmental factors. The C677T variation results in the MTHFR enzyme being about 20% less efficient in metabolizing homocysteine, thus increasing serum levels, especially when plasma folate levels are at the lower end of normal. Supplementing with L-Methylfolate can help alleviate the effects of MTHFR C677T as well as lower the homocysteine levels. CBS defects are upregulations. This means the enzyme works too fast. Therefore, it is common to see low levels of cystathionine and homocysteine since there is a rapid conversion to taurine. This leads to high levels of taurine and ammonia. The upregulation is caused by one or more SNPs. There are 3 SNPs that can cause upregulation of the CBS enzyme. The worst SNP is called the CBS C699T SNP and Dr. Yasko says this may increase the activity of the CBS enzyme by ten times. The NOS mutation can exacerbate ammonia issues. Addressing CBS can help lower excessive levels of taurine and help detoxify ammonia. It is recommended that one supports their CBS enzyme for at least 6 weeks before starting methylation supplements. 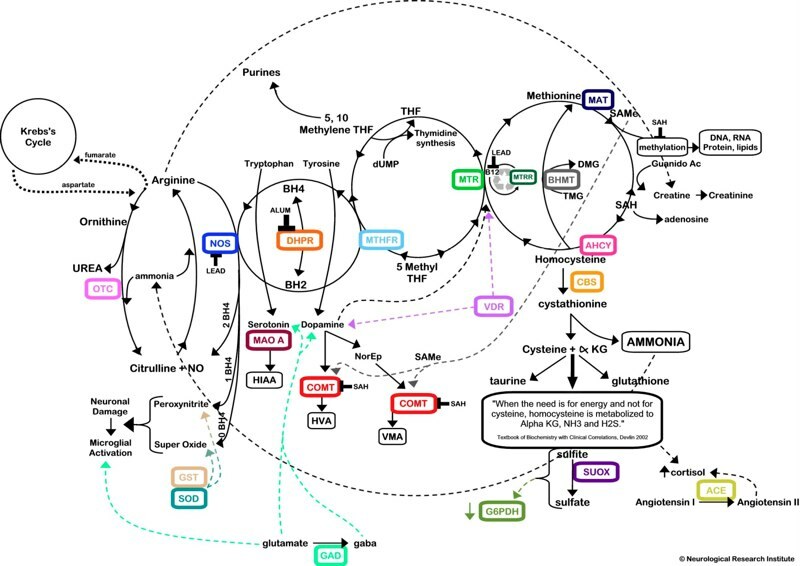 If you try to take nutrients to support their methylation cycle before addressing the CBS upregulation, all the nutrients basically lead to nowhere. Instead of generating glutathione, the supplements may deplete the rest of the cycle. Before one starts adding supplements, it may be a good idea to get a baseline Urine Amino Acid (UAA) test from a doctor. This will determine taurine levels. This is outlined in the Dr. Amy Yasko "Autism: Pathways to Recovery" . One should retest their Urine Amino Acid (UAA). Once the UAA is at 50% or below, you can add the methylation supplements. Taurine should remain at 50% or less. If taurine climbs, then you may need to address ammonia again. Yucca Root and Charcoal or Magnesium flushes can help address high ammonia levels. High doses of L-Ornithine may be effective as well, according to medical studies. The CBS mutation not only leads to excess taurine, but can also lead to excess sulfur groups. For this reason, it may be a good idea to limit sulfur intake for awhile. Excess sulfur intake can trigger a stress response or chronic stress. Sulfur is normally bound to amino acids, but the CBS upregulation can instead release the sulfur groups to sulfites in the body. There are many things one may need to avoid with a CBS upregulation for awhile. Some of the items include garlic, broccoli, eggs, onions, legumes, meat, Epsom salt baths, alpha lipoic acid, glutathione, chelating agents such as DMPS, NAC, Milk Thistle, various supplements and more. Look out for other sources for foods and supplements that are high in sulfur. Supplementing with molybdenum may help as excess sulfites deplete it. Manganese is also important in ammonia detoxification. It's important to measure molybdenum and manganese with a minerals test before supplementing. The CBS Upregulation is a complicated subject! The book by Dr. Amy Yasko "Autism: Pathways to Recovery" explains much more detail. BH4 helps regulate neurotransmitters and mood and can also become depleted with a CBS upregulation. Chronic bacterial infections and aluminum can also lead to low BH4 levels. BH4 supplementation may help in the presence of BH4 deficiency. Supplements that help are slippery elm bark for the gut plus molybdenum, EDTA, carnosine and zinc to help balance the copper/zinc ratio. MTRR Snp's (Methionine synthase reductase) snp's helps recycle B12. The combination of MTR and MTRR mutations can deplete methyl B12. MTR A2756G, MTRR A66G, MTRR H595Y, MTRR K350A, MTRR R415T, MTRR S257T, and MTRR A664A all work together to convert homocysteine to methionine. MTR (5-methyltetrahydrofolate-homocysteine methyltransferase) provides instructions for making the enzyme methionine synthase. Methionine synthase helps convert the amino acid homocysteine to methionine. To work properly, methionine synthase requires B12 (specifically in the form of methylcobalamin). An MTR A2756G mutation increases the activity of the MTR gene causing a greater need for B12 since the enzyme causes B12 to deplete since it is using it up at a faster rate. Mutations in MTR have been identified as the underlying cause of methylcobalamin deficiency. A homozygous mutation of MTR A2756G (2 copies) is relatively rare (<1%). Some studies have demonstrated that people with a combination of MTHFR C677T and MTR A2756G have persistently high homocysteine levels unless they are treated with both B12 and folate. MAO-A (Monoamine oxidase A) is a critical enzyme involved in breaking down important neurotransmitters such as serotonin, norepinephrine, and dopamine. Males only have one allele since the gene is inherited through from their mother since it is located on the X chromosome. Only females can be heterozygous (+/-) for this mutation. When a (+/+) MAO-A mutation is combined with a (+/+) or (+/-) COMT V158M mutation, the person may be more prone to develop Obsessive Compulsive Disorder (OCD), mood swings, aggressive and/or violent behavior, and personality disorders. Chronic infection can deplete tryptophan stores. This can be tested with an organic acid test (OAT) and urine amino acid tests (UAA) according to Dr. Amy Yasko. This test may indicate high levels of 5HIAA (5-hydroxy indole acetic acid). COMT (catechol-O-methyltransferase) helps break down certain neurotransmitters and catecholamines including dopamine, epinephrine, and norepinephrine. Catechol-O-methyltransferase is important to the areas of the pre-frontal cortex. This area of the brain is involved with personality, inhibition of behaviors, short-term memory, planning, abstract thinking, and emotion. COMT is also involved with metabolizing estrogens. COMT (-/-) individuals can usually break down these neurotransmitters efficiently, but COMT (+/+) individuals may have trouble breaking these chemicals down from impaired function of the enzyme. With a COMT+ status, people may have trouble with methyl donors. This can lead to irritability, hyperactivity, or abnormal behavior. They also may be more sensitive to pain. Low or low normal vitamin D values are often seen in those with chronic illness and 98% of the general American population are deficient in Vitamin D.
Low or low normal vitamin D values are often seen in those with chronic illness and even the general population. Low vitamin D is related to many neurological and immunological conditions. Vitamin D stimulates enzymes that create dopamine. Supplementing with Vitamin D stimulates the enzymes that create dopamine. Research shows that supplementing with Vitamin D is beneficial. VDR (Vitamin D Receptor) encodes the nuclear hormone receptor for vitamin D3. VDR Fok has been associated with blood sugar issues and poor pancreatic activity. With COMT V158M + and a VDR Taq + status, the body may have further trouble tolerating methyl donors. VDR Taq (-/-) individuals may already have higher levels of dopamine, and combinations of variations COMT and VDR Taq can lead to a wide range of dopamine levels. VDR Taq (+/+) Those that are VDR Taq (+/+) and COMT (-/-) may have lowest dopamine levels. VDR Taq [+/+] interferes with the production of Dopamine, but [+/-] may or may not be an issues unless the person also has the COMT mutations. VDR taq [+/+] also likely weakens the person's immune system by interfering with initiation of transcription of genes involved in the activity and function of white blood cells. But it can also be that one copy of VDR Bsm and just one copy of VDR Taq might just cancel one another out. If a person has the VDR Bsm [+/+] then they will likely convert Vitamin D3 into the active form Vitamin D 1,25 very quickly. The more Vitamin D 1,25 available the faster the Cystathionine Beta Synthase [CBS] enzyme gene gets transcribed. As a result of this situation more copies of the CBS enzyme are made and because there are more copies of the enzyme the “Transsulfuration Pathway” will be sped up, and that would drain Homocysteine more quickly and the person’s Homocysteine level would be on the low side. Also, the “Transsulfuration Pathway” produces some sulfites and ammonia that would have to be eliminated by the usage of Tetrahydrobiopterin [BH4]. Using up the available BH4 will disturb a number of other biochemical pathways. Homozygous VDR Bsm [+/+] and any number of CBS SNPs it might be important to check to be sure not to take in too much Vitamin D because you "think" you are low in D, because your Vitamin D2 and D3 levels appear to be low, when all along your body is actually making a lot of the active form called D 1,25. Those individuals with VDR Bsm [+/+] should ask their doctor to order their D 1,25 level. VDR Taq and VDR Bsm what does it mean when both are heterozygous [+/-]? The labels are just abbreviations related to the restriction enzymes used to identify the mutations. Bsm = Bacillus stearothermophilus and Taq = Thermus aquaticus. If a person has the VDR Bsm [+/+] then they will likely convert Vitamin D3 into the active form Vitamin D 1,25 very quickly. If you only have one copy it may or may not speed this process up a little. Also eating a little less meat will reduce the production of Ammonia due to the digestion of the proteins in the meat. That too will help to take the pressure off the using up of the available Tetrahydrobiopterin [BH4]. BHMT (betaine homocysteine methyltransferase) acts as a shortcut through the methylation cycle helping convert homocysteine to methionine. The activity of the enzyme can be negatively influenced by STRESS! The Information on this enzyme related to methylation is mostly based on Dr. Amy Yasko's clinical experience and research. A homozygous mutation of BHMT 01, BHMT 02, BHMT 04, can produce results similar to one with a CBS upregulation even if you don't have a CBS upregulation. In her book, "Autism: Pathways to Recovery" she states that a BHMT 08 mutation may "increase MHPG levels relative to dopamine breakdown (HVA)". This can result in attention type symptoms as in ADHD. It is common to see elevated glycine in someone with a homozygous BHMT 08 mutation.